What’s That?, originally uploaded by Folkcat. Koko (himalayan female) and Chanel (black berkshire female). Don’t panic – all shall be revealed. Last any of you knew, our boy Marbles had recovered from his surgery, and was trying to become accepted by the rats in the main colony – Lola, Yuri, Isabella, Leo, Lily, Laurel, Trixie, and Laura. 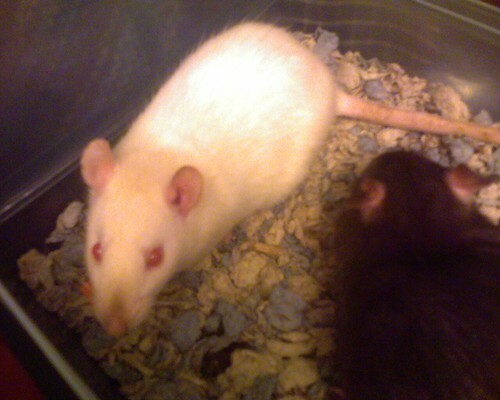 Yuri passed away from respiratory failure the day after we introduced Marbles. The stress may have contributed, but Yuri was getting old and sick anyhow, and almost anything could have tipped him over the edge. Marbles maintained a point in the cage where he was near me, but had easy access to food and water, and was defensible if need be. There were some seeming moments of success, as when Lola appeared to defend him now and then. But in the long run, Marbles was soundly beaten up by everyone in the colony. Marbles and Lola share a rare snuggle. We tried to help by separating him from the others at times, but he kept insisting he wanted to be with them. So we allowed our boy to keep trying, even while we observed multiple fights and numerous injuries to his body. He suffered through two abcesses, and many cuts to the tail, back, and sides. Finally, after about 3 weeks of trying to become one of the family, Marbles accepted us removing him from the main cage, and putting him in a cage by himself. It was a very sad occasion, but clearly our colony had proven that they weren’t going to accept him. At that time, we also noticed that Marbles was showing some distress that wasn’t related to the injuries from fighting. His abdomen was distended, and he was having trouble defecating. We have known right along that he was a high risk for Mega Colon, and apparently it was now manifesting itself. We were distraught! Marbles was clearly in a lot of discomfort. But we researched as we could, and found some sites that helped. Chief among them was www.ratguide.com, which has a series of excellent medical articles about various health problems, including mega colon. We also talked to several veterinary offices, and learned that it’s not a condition often dealt with, so they were unable to offer much advice. In fact, we were gratefully thanked by one office when we told them about www.ratguide.com – they hadn’t previously known about that very useful reference. Marbles enjoys some quiet time on Mom’s desk. In the end, we wound up treating Marbles at home. We switched him to the recommended diet – a high-moisture, low-residue assortment of foods. It has a lot in common with the diet we feed to young rat babies and to pregnant or nursing moms, and includes such items as canned kitten food, baby cereal, soy formula, and whole-dinner baby foods. And, of course, plenty of juicy, fresh fruits and vegetables. Before long, Marbles was able to poop again. And he did so profusely, until the impacted bowel was cleared up, and he was able to function fairly normally again. While that was happening, he began to bulk up even better than before. By the time he had his health again, Marbles was looking like a linebacker, and weighed in at 1 pound, 1 ounce. No more 98-lb weakling – or the rat equivalent, at least. We had a big, burly boy on our hands – but a lonesome one, since the need for a special diet further separated him from other rats. Poor guy! Big and handsome, desperately craving love and attention. Every rat he’d ever known in his entire life had beaten him up. We gave him all the snuggling and attention we could, but it wouldn’t be the same. What would we do? Next time – Mia steps in!